It’s common knowledge that smoking affects your oral health, but let’s not forget about smoking’s destructive counterpart: smokeless chewing tobacco (also known as “snuff”). For those of you who are unfamiliar with this, snuff is a fine grain tobacco that a user places in their mouth between their lips and gums. As saliva generates, the user spits out (instead of swallowing) the saliva tainted black from the tobacco. The result? The user feels the effects immediately as the nicotine goes directly into the blood stream, along with hundreds of carcinogens. Unlike smoking, where carcinogens are present while inhaling, smokeless tobacco is a constant application of carcinogens siting in one spot for an extended period of time. 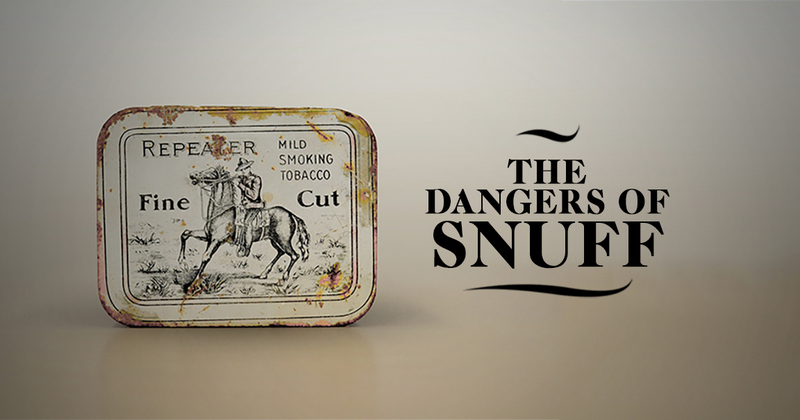 If tobacco were fire, snuff would be like sticking your hands directly in the flame. Snuff can harm your health in a number of ways. Everything from tooth discoloration, throat and gum disease, lung and oral cancers, and in some untreated cases, death. The greatest and most common concern for snuff users is gum cancer. The common warning signs are scaly patterns on the inside of the mouth or lips and red sores. If left untreated or undetected, the condition will develop into oral cancer. So what can you do to avoid developing a serious illness? The first is obvious: stop the habit all together! We know, that’s a lot easier said than done. Try going the route of nicotine patches or gum. You’ll provide your body with the nicotine it craves, while not damaging your oral health. You can also visit your dentist frequently. The ADA recommends that smokeless tobacco users see their dentist more often than normal. Frequent trips to the dentist will help you keep an eye out for oral lesions that may later develop.